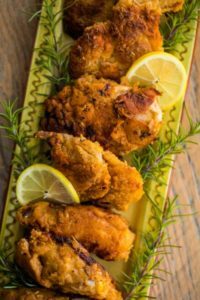 Although the term “soul food” didn’t really appear until about the time of the Civil Rights Movement of the 1960s, the recipes have been around for generations. This cuisine was originally prepared by African slaves in the rural South, with the ingredients that were available to them. Dark, leafy vegetables like collard greens, various meats including pork and other foods that were common in the rural South are found in typical soul food recipes. But soul food is anything but typical. The flavors are rich and bold, the food is filling and the feeling after eating it is comfort and contentment. Spicy, tangy, sweet and savory! 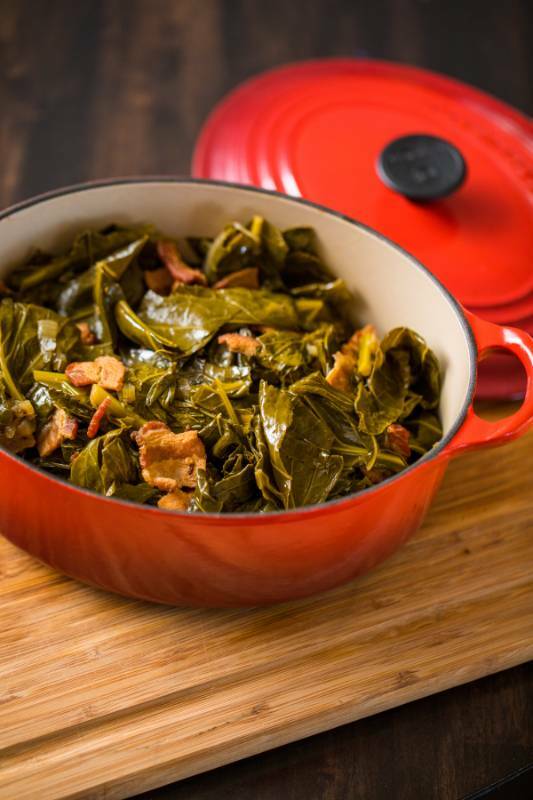 These collard greens have it all and will leave your taste buds begging for seconds! Melt the butter in a large pot. Cut the bacon into 2-inch pieces and cook in butter until crisp. Remove bacon and add sliced onion to bacon grease and cook until tender and slightly caramelized. Add the garlic and red pepper flakes and cook about 1 minute, stirring frequently. Return the bacon to the pot and stir. Add collard greens to the pot, one handful at a time and cook until they wilt down slightly. Sprinkle with sugar and stir in the vinegar. Add the broth and bring to a boil, then reduce heat and cover. Simmer on low for one hour or until tender. Sprinkle with salt and pepper and serve with a side of hot sauce. Serves 4-6. The Old Bay in this tangy dipping sauce adds a little touch of Maryland to create a perfect pairing with these bite-sized pieces of fried okra. In a small bowl, combine dipping sauce ingredients and stir well. Cover and place in refrigerator until ready to use. Slice, rinse and drain okra, then pat dry with paper towels. Transfer to a bowl and pour buttermilk on top, making sure to cover all of the pieces. Set aside. In a medium bowl, combine panko, flour, Old Bay and black pepper and mix well. In batches, remove okra from buttermilk with a slotted spoon to drain off excess liquid and place in flour mixture to coat all sides. Heat the skillet and add enough oil to cover the bottom of the pan (about ½-1 inch). Carefully place the okra in the skillet, making sure that the pieces do not touch. Cook in oil for 7-10 minutes, turning occasionally to brown on all sides. Place on paper towel-lined plate and repeat process until all okra is done. Dust with Old Bay. Let cool slightly, dip in Old Bay Dipping Sauce and enjoy! Serves 4-6. 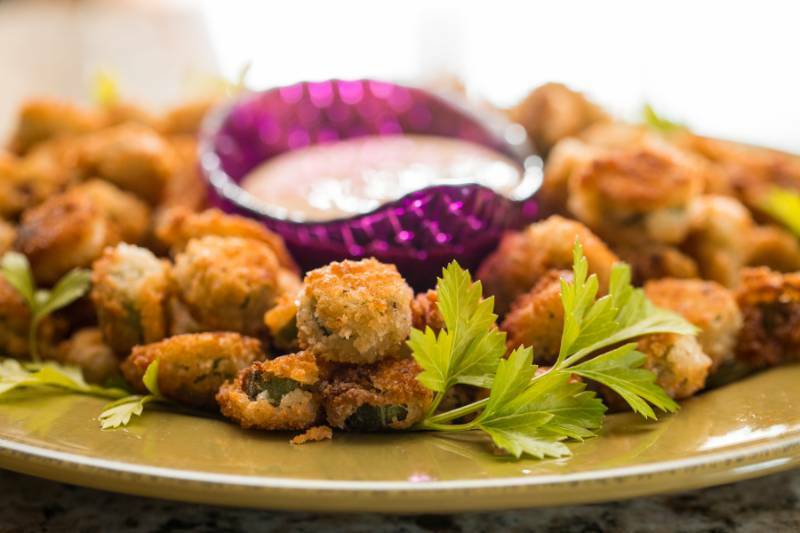 *If fresh okra is out of season, frozen okra works well and can be found in most grocery stores. Just thaw, rinse, drain and pat dry, then follow directions above. Be sure to reserve the buttermilk mixture after marinating. After removing the chicken and dredging in the flour coating, dip the pieces a second time in both for the best results and crispier chicken. Combine buttermilk, hot sauce and garlic in a large bowl. Sprinkle chicken with salt, pepper and paprika. Place chicken pieces in the bowl and push down to coat all pieces. Cover and refrigerate for at least 2 hours or overnight. Line a cookie sheet with paper towels and place a wire rack on top. Remove chicken from buttermilk and drain on wire rack. Reserve marinade. Allow chicken to come to room temperature for 20-30 minutes. This helps the chicken cook evenly and prevents the temperature of the oil from falling too low while cooking. Combine flour, salt, white pepper, garlic powder, onion powder, cayenne, paprika, thyme and rosemary in a large bowl. Mix well and scoop half of the mixture into a shallow bowl. Heat enough peanut oil in a large cast iron skillet to cover about ½ of a piece of chicken. Roll and coat chicken pieces in the shallow bowl of dry ingredients, one piece at a time. Repeat process until all pieces are coated once, adding the rest of the dry ingredients to the bowl as needed. For best results, double coat the chicken by dredging each piece in the buttermilk mixture and then in the flour coating again. Place 2-4 pieces of chicken in the skillet, making sure the pieces don’t touch. It is best to work in small batches to keep the temperature of the oil consistent. Cook on all sides until golden brown for 20-30 minutes, depending on the size of the pieces. Cut with a knife to make sure it is cooked thoroughly. Place on wire rack to cool. Repeat until all chicken is done. Serves about 6-8. 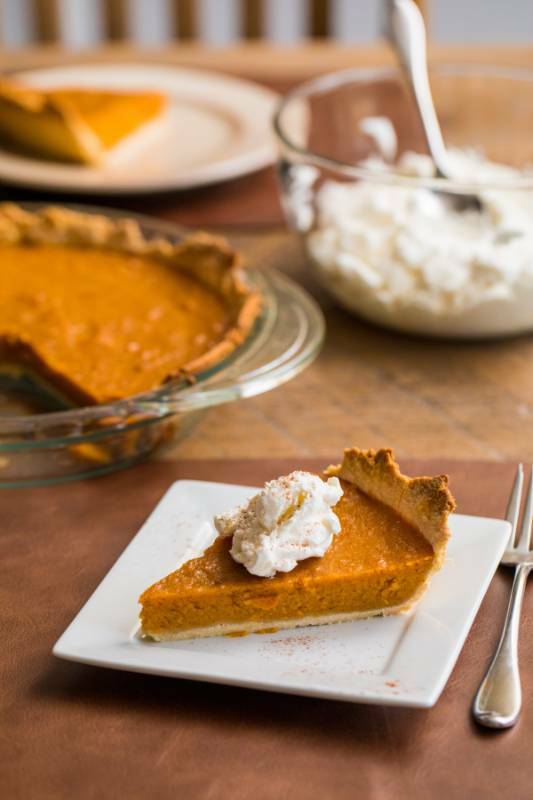 The homemade whipped cream makes this pie a home run! Almond extract adds a twist to this sweet topping, but vanilla works great, too. Preheat oven to 400. Bake sweet potatoes for 30-60 minutes depending on size until tender. Set aside to cool. Sift flour and salt together in a large mixing bowl. Add shortening and chilled butter and gently mix together by hand (or with electric mixer using a pastry attachment on low) until mixture forms into small pea-sized pieces. Add water, 1 tablespoon at a time, until dough is moistened but not wet, and form into a ball. Avoid over-handling so the dough doesn’t get warm. Place dough on floured parchment paper and roll out into a thin, round sheet. Place a 9-inch pie plate upside down on dough and flip over together with the crust. Press the crust into the dish and peel off parchment paper. Shape the crust around the inside of the pie plate and cut off any extra hanging pieces. At this point, you can either crimp the edges to make a nice wave or leave jagged to produce a more rustic looking pie. Place the shell in the freezer for 30 minutes to chill. Mix evaporated milk, eggs, melted butter and vanilla together. 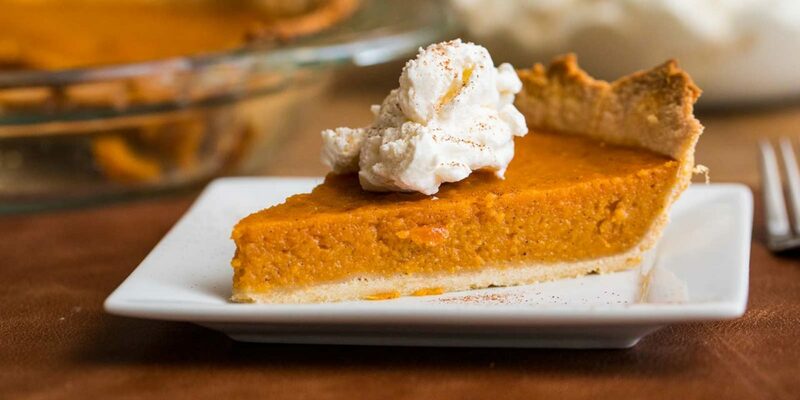 In a separate bowl, combine mashed sweet potatoes, brown sugar, sugar, salt, cinnamon and nutmeg. Add milk mixture to sweet potato mixture and mix well. Pour into unbaked pie shell and bake on 400 for 40-45 minutes. Pie is done when a fork poked into the center comes out clean. Pour cream into mixing bowl and begin mixing on medium high. Add sugar and almond extract and increase speed, mixing for 3-5 minutes until cream thickens and forms peaks. Be sure not to over mix or it will begin to break down. Serves 8.